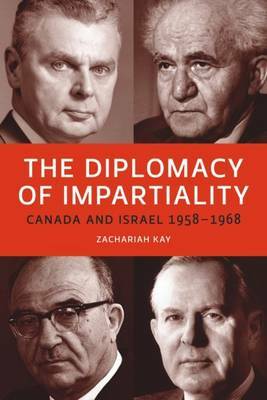 The Diplomacy of Impartiality is an analysis of a major decade in CanadianaIsraeli relations, dealing with significant events that led to the Six-Day War of 1967 and its aftermath. Using primary documentation from the National Archives of Canada and the Israeli State Archives, Zachariah Kay shows that although Canada was committed to Israel's existence, its foreign policy was governed by the scrupulous impartiality that had become a principle guideline when dealing with Israel and the Middle East. The first section of the book deals with the Progressive Conservative government headed by John Diefenbaker in the first part of the decade and his Israeli counterpart, David Ben Gurion. The second section considers the latter part of the decade, with reference to Lester Pearson's Liberal government and the Israeli prime minister Levi Eshkol. The book shows that in spite of political differences between the leaders and their parties, the Canadian bureaucracy maintained a policy of impartiality, following the lines of non-commitment and prudence practiced prior to the re-establishment of Jewish sovereignty in Palestine with the State of Israel. Issues such as the ArabaIsraeli conflict, nuclear power, governments and parliaments, and the pre- and post-Six-Day War are dealt with in detail. The assessed evidence proves that impartiality as a quasi-bureaucratic ordinance kept Canada on the path it maintained in subsequent decades into the twenty-first century. The Diplomacy of Impartiality provides an essential understanding of events surrounding today's Canadian relationship with Israel and the ArabaIsraeli conflict.